So, in October, I had the opportunity for Dressed to Chill to be sponsored by one of my favorite bloggers, Mary Rebecca. I did a guest post on Mary’s blog and spent some time poking around the blogs, Tumblrs, and Twitter accounts of Mary’s other October sponsors, including Erin from eef-ink. I started following eef on Twitter and I ended up adding her lifestyle blog to my Google reader because I liked her illustrations and her posts about when she lived in Germany. Erin and I ended up sponsoring each other’s blogs, too, and I didn’t realize until she commented on my post about living in Indianapolis that she lives here, too. What are the odds of meeting someone on the internet who just happens to live 10 minutes away from me? Erin suggested that we meet up sometime, and I had the idea for us to go to the Indianapolis City Market. You can read Erin’s post about our trip to the market, too. Her pictures turned out a lot better than mine since I like, still don’t know how to use my camera correctly and stuff. The downtown winter farmer’s market happens on Saturday mornings, which is a time when not a lot of movement is going on at my apartment. Gretchen and I are usually hungover, which means the only movement we make is toward Qdoba, and on the rare mornings when I’m not hungover and Colin isn’t working, we usually spend the morning battling consciousness in an effort to stay in bed as long as possible. I love sleeping in on Saturdays, but I also enjoy the mornings where I wake up at a decent hour and actually get out and do things before noon, so a morning trip to the market seemed like the perfect rendezvous with Erin. I met Erin and her boyfriend Anthony at the City Market building downtown. We wandered through the winter farmer’s market first, which had some interesting vendors selling fresh vegetables, cheeses, tea, and beeswax products, among other things. 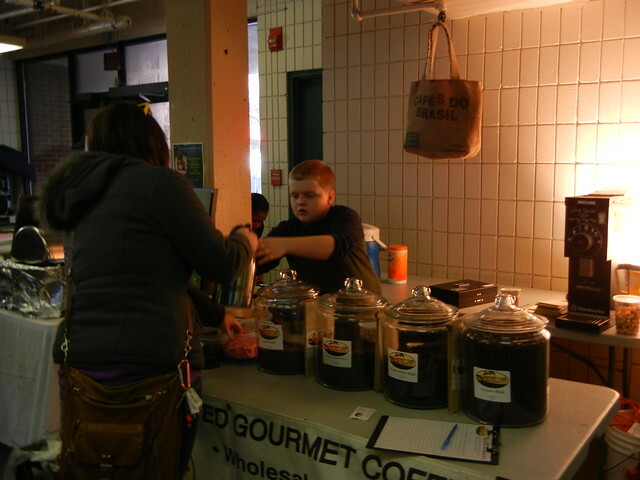 I bought some chapstick from the beeswax guy and Erin and I both got coffee from the 12 year old boy running the coffee stand completely on his own (you can see a picture of him in her post), but everything else was expensive! There were free samples, though, of tea and ice cream and bread with delicious oils, so that was pretty cool. After we snagged some free samples and coffee we headed back to the main part of the market where we decided to go to the crepe shop for lunch. Erin ordered a Nutella crepe with bananas which looked FANTASTIC (especially because of the epic Nutella gun they used), but I was hungry for real food so I went for a veggie option that had red peppers, mushrooms, spinach, and cheese. It was delicious. The guy taking orders was really friendly and showed Erin and Anthony how to use the fancy iPad cash register. He complimented Anthony on his signature and turned to yell “PICASSO ORDERED A CREPE!” to the workers and crowd gathered around waiting for their food. Not a lot of people laughed, but I thought it was funny. 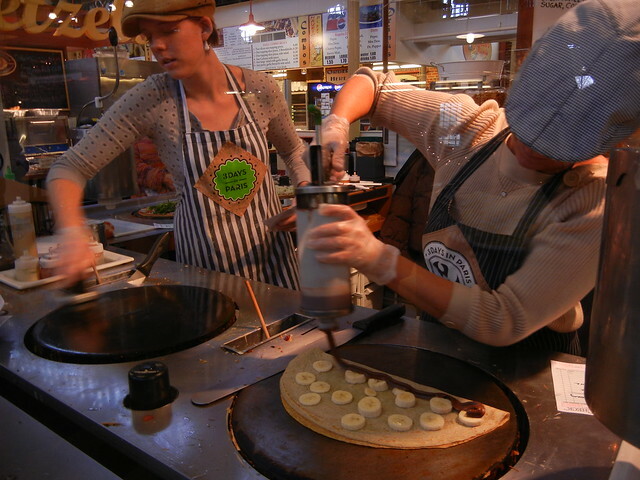 It was so interesting to watch the delicate crepe-making process. I can’t imagine making those all day long, especially with the pressure of such a large crowd watching you as you work, knowing that if you mess up it will affect an entire queue of customers waiting for their food. The final product was delicious, and all in all I’d say our outing was successful. The City Market wasn’t as nice as I wanted it to be–I expected it to be like the North Market in Columbus, which it was, only not quite as awesome. But I definitely want to go back to that crepe shop sometime, and I hope I get to hang out with Erin and Anthony again soon. I joked with Colin and Gretchen that I had a “blog date” with someone I met on the internet. Colin, in his usual cynical fashion, told me not to get murdered, but both he and Gretchen acknowledged that it was vaguely weird but also pretty cool that I had made a new friend in the city through my blog. I thought I was going to feel awkward meeting Erin and Anthony, but I was surprised at how uncharacteristically natural I felt hanging out with them for the first time. Usually I’m shy and sort of uncomfortable around new people, but Erin and Anthony were cool, and I was really glad I got to meet eef face to face and cross “meeting up with a blogger friend” off my bucket list. Be sure to check out Erin’s post for more (better) pictures. Hopefully we’ll have some more Indianapolis adventures to share in the future. We will need to meet up again soon! Glad you guys had fun–I want to go on blate…or whatever the cool kids are calling them!